How will I know how to find my plot again? The plots are marked out by GPS system and we use marker points on the ground to locate each grave. Everyone receives a copy of the map of the burial ground with their plot marked and you will also become familiar with your own way of recognising it. We have also introduced a small tag marking each plot but these will get grown over in a season and will not always be easy to find so do not rely solely on these unless you yourself keep it cleared at all times. We will always mark up a plot prior to a visit if you are uncertain. Can I have a tree on my plot? After looking at other burial grounds and talking to tree specialists we do not offer this because the size of each plot means that trees are too close together unless you set up a coppicing system which we have decided not to do. Most of the site will have trees planted and so your plot will always be in the vicinity of a tree which a lot of people use to navigate by. We will have one open meadow area running from the Roundhouse to the fence so that we keep the open views that so many of us love at Westmill. We only plant native English trees. Our plant list was developed with Paul Darby from the Wiltshire Wildlife Trust. Our Westmill site managers have been monitoring what has proved successful over the years and now we have produced a definitive list based on the original advice. We order all the plants from Naturescape, a wildflower nursery, to ensure we only introduce genuine native species not their cultivated cousins. We have an annual planting day when you can join us or we plant them for you. This is in spring to maximise the plants chances of thriving. We do not garden the site so be aware that some plants may disappear due to the season or our wildlife population. No planting is recommended for at least six months after a burial but we do offer you a packet of wildflower seeds you can scatter once the grave has been filled in. Bulbs from our list may be planted in November at our Family and Friends Day. Do you allow gravestones on plots? We don’t on this site. For some people this means Westmill is not right for them but many people say they feel connected to the whole site and the views as much as to the plot itself. Our beautiful engraved communal memorial stone at the end of our White Horse avenue of lime trees serves as a marker for everyone at Westmill. For those wanting a more personal tablet we are creating a spiral of Welsh slate tablets which are flat to the ground so they do not intrude on the wildness of the site. See separate sheet for full details. How many plots are there and what will happen to the site when it is full? The site has room for 960 burials – each burial plot space can hold 4 ashes. When the site is full it will be maintained as a natural piece of woodland and open ground and will be open for people to visit and enjoy. We do not have any plans to expand the site. Why can’t we have two burials in one plot? Most natural burial grounds do not do this to allow the more efficient rate of decomposition of the bodies. The nearer the surface the faster they become part of the earth again. So we also bury in shallower graves for the same reason – there is no report of any problems arising from this in terms of animals or other difficulties. What will the site look like eventually? It will be like a small nature reserve with open areas such as the memorial circle, paths and glades, tree trunk benches and the fully grown willow bower which will be like a green shelter, proof against wind and weather. We will ensure you can still enjoy the wonderful expansive views by leaving some areas as meadow while at the same time as creating the new woodland habitat. Eventually, some of the willow will go to be replaced by mixed English woodland. The willow was originally planted when a biomass scheme was suggested for Didcot Power Station. They shelved the plan so willow stands are still growing on a lot of local farms! (Some of our willow is coppiced and used for hurdles, baskets, etc.) The earliest burial area near the willow bower was begun in 2000 and shows you how the rest of the site will develop over time. How can I be sure that the burial ground will not be turned into something else? The honest answer is that no site is absolutely 100% secure as we all know but it is very unlikely that anything will happen to Westmill for the following reasons. It is not easy to reverse permission on land where burials have taken place so there is a security in that fact but it has happened elsewhere with historical sites. The financial security and long term maintenance of the site is secured by our putting aside 20% of each burial fee into a future fund held at Triodos Bank for this purpose. It will not be touched until we no longer generate in income from new burials or pre-payments on the site. 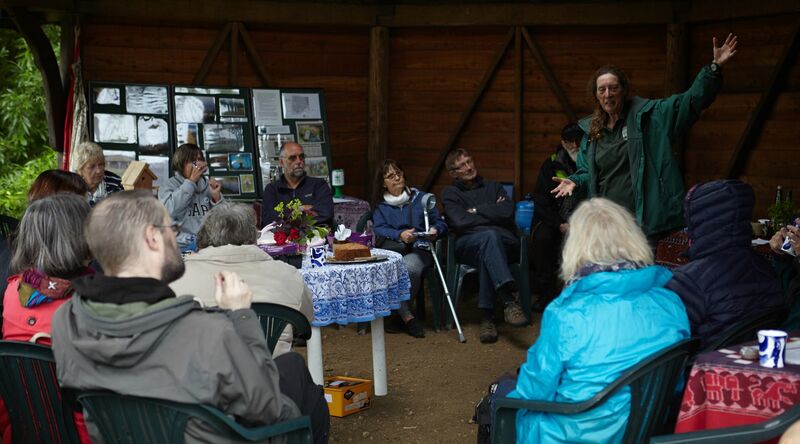 Westmill Woodland Burial Ground is a not for profit business run as a CIC with Adam Twine and Liz Rothschild as its directors. All the assets of the company have to stay within the business and can only to be passed on to another CIC or charity. This ensures the safety of the business financially and that it will not be turned into a business with a very different ethical approach. The land is currently owned equally by Adam Twine and his sister Jane Twine. He farms the whole of Westmill Farm of which the 3 acre site is a small part. This means Adam has a strong voice in what happens to the future of the burial ground. Liz Rothschild has both her parents and her godmother buried at Westmill and intends to be buried there herself so she has very personal reasons for wanting to ensure there is no threat to the site in future. Can I bring up music/picnic/drinks/etc for the funeral? We aim to help you create the celebration you want of the person who has died. Our staff will always be there to support you whether you use an undertaker or do it all yourself. We like to encourage people to really think about what they want and what feels right to them. It may look like other funerals you have been to and liked or it may be quite different. Each person and family is different and we hope the funeral will reflect that. It can take 20 minutes or all afternoon and involve 4 people or several hundred. We never have more than one funeral a day at the moment and the most we would ever have is two so you will always have all the time you need. Why don’t you allow embalming? It is not necessary except in the case of expatriation when we allow it. It is an unnecessary interference with the body when keeping it cold does all that is needed. Avoids introducing unwanted chemicals into the earth. Can we come and visit any time? Why can’t I reserve a plot? We have decided to stop selling unallocated plot reservations as it was tying up too much money for forward planning. It was also potentially creating a lot of future work for those to follow long after Liz and the team have moved on (or in!) themselves. However, if you are arranging a funeral for a family member or a close friend and you would like to ensure that you or another member of your family can be buried close to them when the time comes then we can still reserve a plot under these circumstances.